The Gowanus Lounge shot video of the "Save Coney Island" demonstration at City Hall Friday. “ 'I think a lot of positive things have come out of this protest already, and it hasn’t even started,' said [Dianna] Carlin, the owner of the hot pink boutique Lola Staar who was evicted by Thor Equities in February. She said she spoke to Sitt on the phone for an hour last week, and he offered her a new lease for the coming season. 'It was really extraordinary that he took that long to speak to me and he seemed really willing to listen to my views,' said Carlin. 'But I made that clear to him that regardless of if he offers this agreement to me or not, I would continue my work with opposing condos in the amusement district.' " Story here. A tipster to Curbed reports that the "amazing apartments" over Fairway are finally ready: "Thought you'd like to know we got a call yesterday that the Fairway apartments now have their certificate of occupancy. Move-ins start sometime in April." See more here. "Without so much as a 'Bob’s your uncle,' the Strober Brothers Organization, a large building supplies company, has moved from Pier 3 beneath Brooklyn Heights to 11 West Street in Greenpoint. 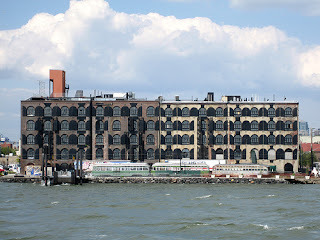 This move was officially completed on Tuesday, March 27, and pretty much completes the removal of tenants from Piers 1 to 6, the site where most of Brooklyn Bridge Park will be constructed...."
Circle Line Statue of Liberty Tour Boat to Leave from Brooklyn Bridge Park? The NY Times informs us of the possibility that Circle Line Statue of Liberty sightseeing boats may one day soon pick up touristas from the yet-to-be-built Brooklyn Bridge Park. 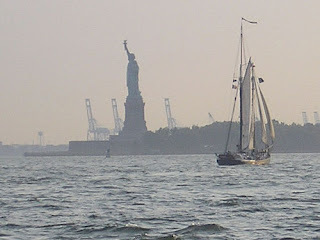 Says the Times: "Boats operated by Circle Line Sightseeing, the company that currently takes tourists to the statue and Ellis Island, leave only from Battery Park in Lower Manhattan and Liberty State Park in Jersey City. City officials want to expand that service to other areas they plan to redevelop, including Governors Island and Brooklyn Bridge Park." Several companies are expected to bid against Circle Line for the new contract, which would run for 10 years starting in the fall, according to the Times. More details here. Brooklyn Heights residents no longer need suffer from Cobble Hill envy, says Chowhounder correspondent Peter. Now Heights residents will be able to purchase a CSA (Community Supported Agriculture) share and get fresh, crisp organic produce every week. It works like this: In the spring, CSA members buy a "share" of the farm's produce which helps cover the anticipated costs of the farm operation and pay the farmer a living wage. 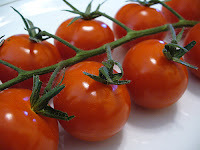 In return, members receive their cut of the farm's bounty throughout the growing season, as well as quite a bit of satisfaction from helping to keep a family-run organic farm in the black. Pick up will take place Wednesdays at the Unitarian Church on Monroe Place (thank goodness for those Unitarians!). See here for details. See here for all NYC locations. Neighbors Ask: What Will Become of the Vast Network of Underground Tunnels? The Watchtower Bible and Tract Society — the Jehovah’s Witnesses — will be offering for sale the large property it owns at 169-171 Columbia Heights, formerly the Standish Arms Hotel, the Brooklyn Eagle has learned. According to the Eagle's Dennis Holt, the Witnesses use this 12-story building for residential purposes. The Watchtower has been in the process of reorganizing its operations, transferring many of them to facilities in upstate New York. See here for more. More comments on the Brooklyn Heights Blog. UPDATE: The Brownstoner blog latched onto this story Thursday and the comments have been pouring in. Some correspondents focused on the benefits to the area's tax base (once the JWs have left). Others wondered when the religious group would sell the nicely renovated Bossert (on Montague Street). One Brooklyn Heights neighbor notes that no matter what you think of the JW's, they don't seem to add to the parking hassle in the nabe: "... guess it's all their carpooling, their Dumbo parking lot and the 24-hour shuttle buses for church members." But perhaps the most interesting comments focus on the vast network of tunnels connecting most of their Brooklyn Heights buildings, and what will become of them when their buildings are sold: "... They have built an extensive system of tunnels connecting most of their buildings underground and providing them with a safe haven when Armageddon comes, which was supposed to have been in the 1980's but has been pushed back. They will need to seal the tunnel entrance under the Standish Arms now..."
Tuesday evening at about 7:45 at least seven fire trucks responded to a fire in Brooklyn Heights that could be smelled all the way down in Cobble Hill. 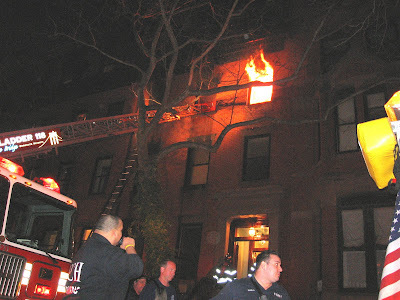 It was the second fire in four months (the last around Thanksgiving) at 42 Remsen Street between Hicks and Montague Terrace. 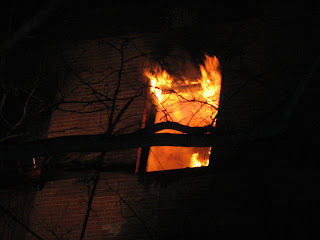 The fire broke out on the third floor, as can be seen in these pictures by photo journalist MK Metz. 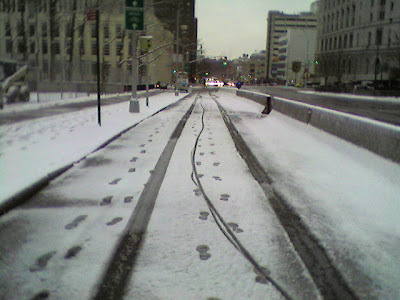 A correspondent to the Brooklyn Heights blog said: "This same apartment had a fire on Thanksgiving weekend. Apparently there is a not so right in the head woman living there who collects a lot of paper and garbage ... The family that lives on the ground and parlor floors, who financed the rebuilding of the outside staircase which won them building a Heights Assn award a few years back and had a very, very nice apartment were understandably beside themselves. I believe they suffered a lot of water damage then, and I don't even think that they had moved back in yet. This obviously is much worse - it looks like the building may need to be gutted..."
UPDATE: The full story has now been posted to the Brooklyn Eagle Web site. See here. First there was the fire. Then there was the closing. Finally, there was the real estate frenzy, reports Mary Frost in a Brooklyn Daily Eagle story about the "unfounded rumors that the historic Catholic school building — occupying a nice chunk of prime real estate in Brooklyn Heights — would be sold." Apparently, the days of unbridled speculation are now over, says the Eagle. The Diocese of Brooklyn has issued its final word on the fate of the Sidney Place school, which was damaged by a basement fire on Feb. 6 and subsequently closed. According to diocese spokesperson Frank DeRosa, the building will be restored "with the intention of reopening at a later date as a Catholic-based educational facility of some kind. One possibility for the restored facility is an early childhood program under the auspices of Catholic Charities." Read the Eagle story for more about this Brooklyn Heights real estate "Feeding Frenzy." City: Developer Joe Sitt a 'Huckster'? The NY Post says that City officials have called developer Joseph Sitt -- the man promising a "Vegas-glitz makeover for Coney Island" a huckster with a history of flipping properties for a fast buck. One Post source said, "He's done it already in Coney Island and other Brooklyn projects like [Downtown Brooklyn's] Albee Square Mall, and who's to say he won't play the city again?" For more see here. Previous post on the Coney Island redevelopment plan here. Photo by Slava, Creative Commons license. Some Brooklyn residents held a bake sale to try to help save the Domino Sugar Plant, according to NY1. Members of the Waterfront Preservation Alliance sold foods they made using Domino Sugar to raise awareness about the structure that they're trying to landmark. See the full story here. England's National Grid and (Brooklyn and Long Island's) Keyspan have announced an "amended agreement" with the Long Island Power Authority to operate the electricity and power transmission business on Long Island until 2013. This brings us one step closer to the controversial merger of National Grid and Keyspan, expected to go through mid 2007. Not everyone sees this as a good thing, of course. According to Newsday, legislators and experts who were "already wary of the proposed buyout of KeySpan by National Grid" were unmoved by the news, saying that the $236 million-plus in promised benefits "fall short." U.S. Senator Charles Schumer said, "I remain skeptical that the merger will benefit ratepayers." According to Long Island Business News, "The State Department of Public Service issued a 200-page report that slams the proposed merger between KeySpan and National Grid, calling it a bad deal for customers." For a previous story about the merger, see here. See more on the Tillary Street bike lane here. Hampton Jitney will pilot a new service this spring from downtown Brooklyn to the East End, reports the New York Observer Real Estate. There will be at least one, and maybe two, stops in the borough. The brains behind this happening is Borough President Marty Markowitz. The Gawker blog offers a delightfully snide take on this, starting with the headline: "Brooklynites Will Bring Their Comical Accents, Foul Habits to Delightful Hamptons Bus"
Habitat for Humanity-New York City is looking for Brooklyn families who would like to own their own condos at a new “green” complex that will be rising soon in Ocean Hill-Brownsville, reports the Brooklyn Daily Eagle. Applications are now open for affordable one-, two- and three-bedroom "green" condominiums to those who are eligible: New York families earning between $35,450 to $56,700 for a family of four — as well as meeting other criteria. The estimated move-in date is late 2008. According to the Eagle, the future homeowners must be willing to work with volunteers to help build the homes, and to commit to a minimum of 300 hours of “sweat equity” per adult to a maximum of 600 hours per family. There are other qualifications, as well. See the story here for more. 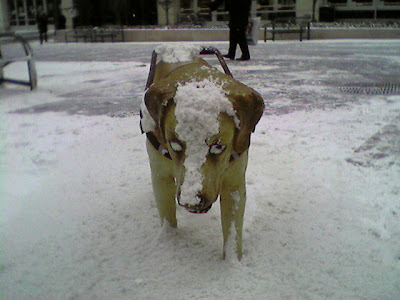 Tony Matelli's "Stray Dog," a life-size resin sculpture of a lost seeing-eye dog, shivers in the snow at MetroTech in Downtown Brooklyn. 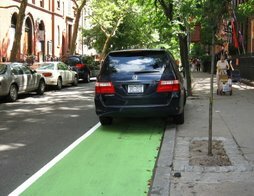 Automobile drivers haven't yet realized that the dedicated bike lane on Tillary Street between Cadman Plaza West and the Brooklyn Bridge is not for them. Poor signage has something to do with it, but bikers wonder why some sort of car barrier can't be put up. Here's one of a series of photos illustrating the potentially dangerous juxtaposition of various forms of locomotion venturing where only bikes should roam. The Gowanus Lounge awoke this morning to find "a fascinating article on the Coney Island redevelopment proposed by developer Joe Sitt and Thor Equities from the Brooklyn Daily Eagle that has been posted on the Coney Island Message Board. The Gowanus Loung lists about eight interesting points, including the fact that Thor Equities continues to say that an amusement park alone will lose money; and the purchase of Astroland came as a surprise to city officials, who weren't counting on Mr. Sitt buying an operating amusement. GL also links to the Kinetic Carnival blog, which has some interesting thoughts on the article. KC links to the Save Coney Island myspace page, which Sarah Ryley of the Brooklyn Eagle reveals to be run by Lola Staar's Dianna Carlin. See past post on this topic here. An "alleged" aggressive marketing campaign to interest potential buyers in the two-story building at 88-96 Clinton St. in Brooklyn Heights, now housing outpatient offices affiliated with Long Island College Hospital, has raised worries at the Brooklyn Heights Association, according to a story by Linda Collins at the Brooklyn Eagle. 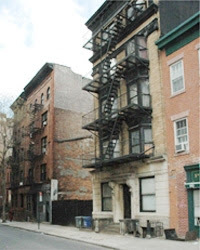 Although the building, on the northwest corner of Clinton and Remsen Streets, lies within the Brooklyn Heights Historic District, it is not covered by the district’s 50-foot height limitation for new structures. A rendering of a potential 14-story tower was submitted anonymously to the Eagle. 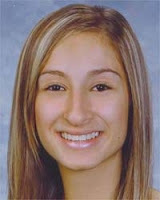 Kristin Molini, a 19-year-old alumna of St. Saviour High School in Park Slope and a resident of Gravesend, has been placed on a priority transplant list for a stomach, pancreas, and small intestine at Children’s Hospital in Pittsburgh and is awaiting the call. Kristin’s family has to come up with one million dollars. The St. Saviour Student Council is trying to raise funds. For information on how you can help, you may email Kristin directly at lilkrissybabee@aol.com or contact Mrs. Mary D’Emic, director of guidance at St. Saviour High School, (718) 768-4406. Half of New Yorkers don't even know it's there, says the Norwalk Advocate. Many of its visitors are bird-watchers from around the world, not even from Brooklyn. 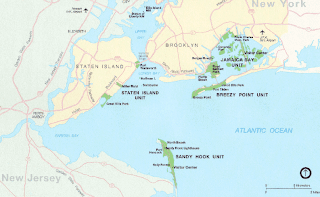 It's the Gateway National Recreation Area, which contains Jamaica Bay, the only wildlife refuge center in the National Park system. Those who do visit the park, a recent poll found, often rated the restrooms, beaches, trails and other facilities below average compared with other national parks. So the National Parks Conservation Association has launched an international competition to create a new vision for Gateway as a world-renowned national park. The contest is called "Envisioning Gateway." Contestants will be asked to look at the park "in terms of public transportation, access and what elements can be created to make it stand out as a national park," Alexander Brash, the NPCA's regional director in New York, said. Ecologists, landscape architects, urban designers, planners, students and others are invited to send redesign proposals to the Web site. First prize is $15,000. Winners will be selected in June. See here and here for more. Bakery Coming to North Heights? 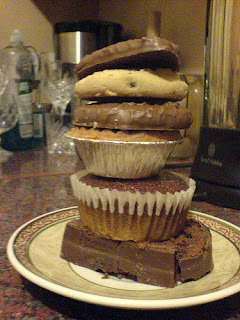 "Our bakery is ... brimming with a divine selection of moist cakes, fresh pastries, dreamy cookies, flaky pies and exquisite muffins. 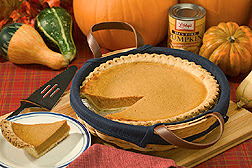 All made with all-natural ingredients and for special diet needs you'll find delicious choices low in fat, sugar and gluten-free." 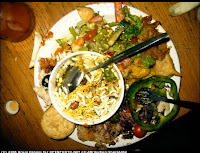 Quite the little food fight is breaking out on Homer Fink's Brooklyn Heights Blog ... touchy, touchy. All Homer said was that some of the restaurants in the North Heights -- Jack the Horse Tavern, Henry's End, Le Petit Marche -- seem to be adding up to a (minor, we admit, but pleasant) food scene. Well! You'd think he left his cell phone on during a concert at Bargemusic! One comment even ran to ALL CAPS! Same M.O. as the Citibank heist just over a week ago: on Saturday afternoon, a man described by a bank employee as "white, about six feet, 190 pounds" robbed Commerce Bank at the corner of Montague and Court Streets in Brooklyn Heights. He got the loot, and left a package suspicious enough to bring in the Hazmat squad. The easternmost block of Montague Street was closed as the package was checked out. Two hours later, the bank was reopened for Business As Usual. This photo, courtesy of MK Frost, shows a Hazmat-suited police officer walking into the evacuated Commerce Bank on Montague Street. The Parks Department spread truckloads of soil around the north oval of Cadman Plaza Park in Brooklyn Heights (OK, technically in Downtown Brooklyn) earlier this week, before the snow. The soil, which smelled strongly of horse manure when it was deposited, is rich with "organic matter," according to the Parks Department. A Parks Department employee said that the soil was imported from Shea Stadium, and was highly sought after by NYC parks. The other half of the park has been covered with artificial turf, and will remain fenced in till the end of the month. UPDATE: It is sooo past the end of the month, and the synthetic turf portion of the park is still fenced in. Word now is May! The Gowanus Lounge reports that nearly 500 people turned out for a Community Board meeting in Park Slope last night to oppose a Department of Transportation proposal to turn Sixth and Seventh Avenue into one-way streets. More than 160 people squeezed into an auditorium before doors were closed to chants of "Let them in! Let them in!" Let's just say there was "significant community opposition to the plan." See here for more. The Department of Education seems to have miscalculated when it announced that it will be placing (for at least three years) a new Arabic-themed upper school into an existing Park Slope elementary school building, P.S. 282/Park Slope School. Parents at P.S. 282 are furious, reports the Brooklyn Eagle. Their school (number one in District 13) will apparently have to give up its music room, library, art room, etc. to make room for the Khalil Gibran International Academy. Khalil Gibran will eventually serve grades 6-12 -- another bone of contention for the parents of the elementary school kids in P.S. 282, who worry about their youngsters sharing the facilities with much older students. The Brooklyn Eagle reports that Khalil Gibran, slated to open this September, is meant to expose its sixth- through 12th-grade students of all races to Middle Eastern language and culture. Naturally, there has been some hostility to the idea by people who don't seem to know much about its purpose (non religious and non political) and its founders (a lot of Brooklyn Arab groups, interfaith groups, Lutheran Hospital, New Visions for Public Schools and more). Doesn't seem fair to either school. See more here. A real dog, on the right, longs to meet Tony Matelli's "Stray Dog," a life-size resin sculpture of a lost seeing-eye dog, at MetroTech. The Gowanus Lounge reports that opposition to developer Joe Sitt's and Thor Equities $2 billion Coney Island redevelopment scheme "seems to be galvanizing." Case in point, says GL, is "Save Coney Island," a new group that opposes Mr. Sitt's vision of housing in Coney Island's amusement zone. It's planning a "No Condos in Coney" protest outside Thor headquarters soon, GL reports. Chowhound takes up the meaty topic: Where to Take a Client for Lunch in Brooklyn. CH correspondent Marion Morgenthal writes: "Le Petit Cafe on Court Street is absolutely charming--they have an enclosed (heated) back garden that's lovely. 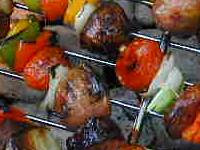 Good, wide-ranging lunch menu, and it's generally not too crowded during the week. Some other ideas would be Mai, Downtown Atlantic, Jolie or Waterfront Ale House on Atlantic Avenue." Any other suggestions? 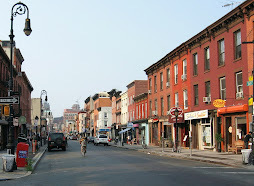 Smith Street is easy, but how about in Brooklyn Heights? Photo by Bruce Denney, Creative Commons license. 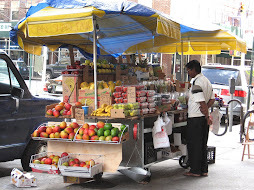 While the plans for improving the streetscape along Flatbush have gotten a lot of attention recently, there has been no apparent progress on the promised improvements along the Boerum Place corridor (also known as Brooklyn Bridge Boulevard), says the 110 Livingston blog. DOT plans include green plantings in the median, bike lanes, safer pedestrian crossings, wider sidewalks, and better turning lanes. Matthew Bourne returns to BAM with a stage adaptation of Tim Burton's film, "Edward Scissorhands," March 14 -31. A huge hit at its London premiere, audience members called it "amazing." This video (make sure you have your speakers on) is pretty amazing itself. Everybody's talking about it: Does the thought of an upcoming storm surge make any difference in your decision about where to live? Say, for example, you found a sweet deal on a hot new co-op in Red Hook. Does the realization that your co-op would be smack-dab in ZONE A make any difference to you? Curbed hosts a couple-a-dozen comments along the lines of "I don't know if a once-a-century (no, once-every-two-centuries) event should force us to make drastic changes;" and "Well, one recent development is that it is nearly impossible to get renters insurance now if you live in an evac zone." 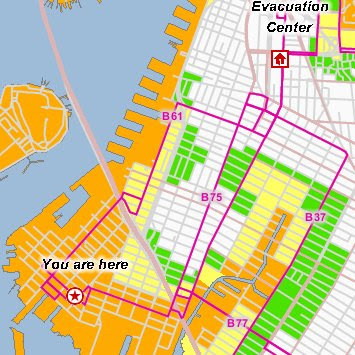 The Office of Emergency Management offers a handy Hurricane Evacuation Zone Finder. Shown here: Red Hook, with a star on Coffey Street. Residents in Zone A (orange) face the highest risk of flooding from a hurricane's storm surge. At a City Council hearing last week, DOT Commissioner Weinshall boasted of the traffic-calming benefits achieved in Downtown Brooklyn by "converting one-ways to two-ways." At the PSCC’s transportation forum attended by hundreds of residents, there were many complaints about pedestrian safety and dangerous speeding problems on Eighth Avenue and Prospect Park West, both fast-moving one-way streets. USA Today recently reported that hundreds of towns and cities around the U.S. are converting their 1950's-era, one-way, through-traffic streets back to slower, more neighborhood- and business-friendly, two-way streets. Forest City Ratner's Atlantic Yards will add even more Class A office space, notes The Real Deal. See more here. An End to Brooklyn Development? So what happened at the first ever Brooklyn Real Estate Roundtable at the Brooklyn Historical Society? The Brooklyn Eagle reports that it attracted 100 attendees (40 were initially expected). 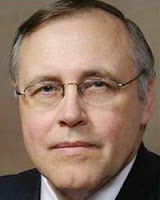 Steven Spinola, president of the Real Estate Board of New York focused on "the recently-passed and controversial reform to the 421-a property tax exemption program for builders of new housing." He said he told the mayor that the reform was “a major, major mistake." Spinola said he believes the reform measure — which, the Eagle has reported, applies to Downtown, DUMBO, Brooklyn Heights, Carroll Gardens, Cobble Hill, Boerum Hill, Park Slope and Gowanus; most of Fort Greene, Prospect Heights, Williamsburg and Greenpoint; and portions of Sunset Park and Bushwick — will put an end to all the development. Already, he said, there is a rush by developers to “get their footage in the ground by Dec. 28” (the reformed 421-a program, which mandates 20 percent of units to be affordable, takes effect Jan. 1, 2008). See what else Brooklyn's developers discussed here. Curbed has performed a public service by publishing a "Atlantic Yards Made Easy Guide." For those who are wondering just what the heck is going on at the corner of Atlantic and Flatbush, click here. One of the last of very few remaining vacant lots in Brooklyn Heights will soon be filled with a new residential building, according to a story in the Brooklyn Eagle. The new owners of the vacant lot at 73 Pineapple St., near Henry Street, who also purchased the two adjoining buildings at 71 and 75 Pineapple, have filed a preliminary permit application with the Department of Buildings to construct a new 10-unit, five-story, 50-foot-tall residential building (50 feet is the maximum allowed under the special height restriction in the Brooklyn Heights Historic District). Photo by Don Evans, courtesy of Brooklyn Eagle. The Real Deal reports: "A lot of the chains are going to leave Montague Street for Court and Atlantic, where they get far more exposure and where there's better transportation and parking," predicted [developer David] Walentas." According to The Real Deal, Walentas said either Urban Outfitters or a Loehmann's department store will take over the first two floors of the Independence Savings Bank. Just down the street at Smith and Atlantic, Boymelgreen is said to be "leaning toward leasing to a high-end national restaurant chain to complement the building's 93-room boutique hotel." Developer Mark Chemtov is looking to bring in a national furnishings chain such as Restoration Hardware or Pottery Barn to his project, a seven-floor luxury building on the site of a former Mobil station between Smith and Boerum Place. The Real Deal reports that a complex of mixed-use buildings is planned near the congested intersection of Atlantic and Flatbush avenues. According to the Real Deal, developer Barbara Koz Paley's project, Atlantic Gardens, "... will transform eight buildings into shops with glass walls that will line the project's main draw: a 3,000-square-foot garden with café and restaurant seating, in addition to open space for shoppers and residents." The site is near the planned Atlantic Yards project. The Brooklyn Eagle reports that after almost 70 years, Brooklyn's Empire Roller Skating Center has announced that it is finally closing its doors on April 23. Rink operator Michael Feiger said that it would be turned into a storage facility — online rumors said it would be used for a Costco warehouse. The Eagle says that the rink was built in the late 1930s on a site that had been used as a parking lot for the Brooklyn Dodgers. "And for those that care about expertly made cocktails, Jack the Horse can appear as godsend: A gorgeous bar on one of the most idyllic streets in the whole city that is actually as good as the atmosphere." Jack the Horse is at 66 Hicks Street. 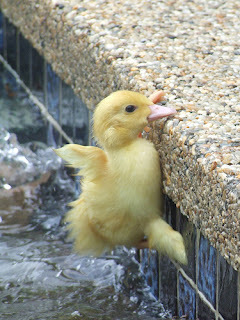 But What About the Ducklings? Bloomberg.com carries an analysis of the moves England's National Grid Plc is making in its bid to win New York State approval for its purchase of KeySpan Corp (once called Brooklyn Union Gas, with headquarters at MetroTech -- and a window full of ducklings every spring). Among the concessions offered: National Grid says it will share merger savings with natural-gas customers (for three years) and spend $1.4 billion upgrading its Niagara Mohawk utility, blamed for an unusually high number of blackouts. Debt at National Grid would rise $11.4 billion to finance the purchase, an amount that threatens its credit rating unless the state agrees to "unreasonably high rates'' for gas customers, reports Bloomberg. "Staff's testimony appears to consist largely of a series of speculative assertions about 'worst case' possible outcomes,'' KeySpan Chief Executive Office Robert Catell said in written testimony, adding that the merger will moderate rate hikes that would otherwise hit 11 percent. The Public Service Commission is expected to rule on the merger this summer. Update: The Times reports that the former top spokesman of KeySpan claims in a federal lawsuit that he was improperly fired four years ago as punishment for alerting executives to allegations of accounting irregularities involving hundreds of millions of dollars. See story here. Poolaid (www.poolaid.org) is a place where "lovers of McCarren Pool can come together to get information about the pool and take action to keep the pool in the hands of the community." The "We Are the Pool" video has been released, says Poolaid. The video is "intended to encourage community participation in the pool and keep corporate interests out. We want to swim!" Earvin "Magic" Johnson and his joint-venture partner, Canyon -Johnson Urban Fund, will provide $12.4 million of financing to help build a 130-unit condominium in Greenpoint, to be called 110 Green Street Condominiums, according to Crain's New York Business. Johnson and friends also have invested in the condominium project in the landmark Williamsburg Savings Bank building and a project on the site of the former Brooklyn Tabernacle in Park Slope. Zipcar said today it will double its entire Brooklyn fleet to bring nearly150 vehicles to the borough by the end of 2007. Zipcar also said it will launch service into Williamsburg, "helping to alleviate the growing parking and traffic challenges in the rapidly developing neighborhood." Is This Brooklyn's Most Expensive Rental? Sotheby's lists a rental in Brooklyn Heights for $40,000 a month. The house -- called the "gem of Brooklyn Heights" -- has nine bedrooms, seven baths and a lovely "wrap veranda" out back. According to Brownstoner, the address is 70 Willow Street, where Truman Capote once "hung his hat." Is this rent justified? Or, as one Brownstoner correspondent says, is it vulgar? 6th and 7th Ave's One Way? NY1 reports that the city transportation department wants to make Park Slope's Seventh Avenue one way and do the same to Sixth Avenue. NY1 says the plan is drawing "mixed reaction" from residents. "It's an unpopular idea because it's completely unsafe,” said one area resident. “It's going to turn Park Slope, which is a residential community, into one that's full of traffic." 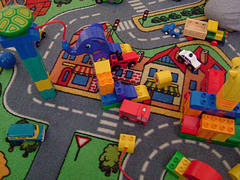 "I think it'll ease the flow and I think it'll be safer for pedestrians. I think it's a great idea," said another. See the full story at NY1. 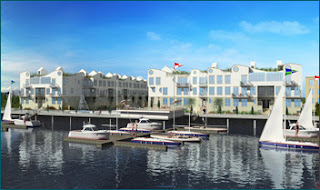 "The Breakers" in Sheepshead Bay with its waterfront (actually "over the water") condominium units, private marina boat slips and seaside boardwalk is finally ready for sales, says Linda Collins of the Brooklyn Eagle. Residential real estate firm Brown Harris Stevens announced this week that sales have begun for the 75 luxury residential units with prices ranging from $377,000 to $1.585 million. More about this private gated complex in the Eagle. On Valentine’s Day more than 150,000 condoms were distributed throughout the city. The condoms were branded “NYC CONDOM,” with the letters "NYC" in circles similar to those of the New York subway system. Since then, millions of free condoms have been distributed to the public, to the chagrin of Cardinal Edward M. Egan of New York and Bishop Nicholas DiMarzio of Brooklyn. These Church leaders said that city officials “encourage inappropriate sexual activity by blanketing our neighborhoods with condoms.” A visit to the NYC CONDOM web site shows just how much blanketing is going on. Sarah Ryley of The Brooklyn Eagle beat the rest of New York's media to the punch with her article concerning reaction to the three pages of financials released on Atlantic Yards. The long-awaited Empire State Development Corporation (ESDC) financial analysis, provided by developer Forest City Ratner Companies, projects $571 million in “total investment cash flows” by the year 2015. “A handful of three faxed pages of a chart or two is insignificant. And we’re not interested in drips and drabs,” said Assemblyman James Brennan of Park Slope, according to the Eagle article. The estimate has some conspicuous omissions such as the profits from the planned 180-room hotel that would be housed in the project’s centerpiece building, “Miss Brooklyn.” See the Eagle for details. This year's Dine in Brooklyn event -- where you can enjoy the fare at a number of Brooklyn's best restaurants for only $21.12 -- takes place March 19-30. A few establishments (such as Dhaka Indian Restaurant on Atlantic Avenue and RICE) are offering three-course meals for half that price -- this is, two people dine for $21.12. See A Brooklyn Life's Top Ten picks. These include Applewood and Blue Ribbon. 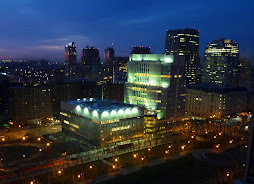 Linda Collins of the Brooklyn Daily Eagle reports that a group of Brooklyn developers is partnering with the Brooklyn Historical Society to launch the new Brooklyn Real Estate Roundtable. The steering committee reads like a Who's Who of Brooklyn real estate development: David Kramer of The Hudson Companies (J Condos); Eric Brody of The Brody Group; Sara Mirski of Boymelgreen Developers; David Von Spreckelsen of Toll Brothers; Lou Greco of Second Development Services; Chris Havens of Two Trees; Michael Kaye of Douglaston Development; Jason Muss of Muss Development; Jay Schippers of Jay M. Schippers Realty; Joseph Sitt of Thor Equities. The program for the March 7 luncheon will focus on property taxes. See the Eagle story for more. The city's plan to close down the docks in Red Hook - where hundreds of workers unload cargo from international ships - by the end of the month were halted last Thursday, says the Daily News. "This is a great victory for the Red Hook Port. The clock has stopped," said Matt Yates, spokesman for shipping company American Stevedoring International. The Brooklyn Eagle reported that Congressman Jerrold Nadler called the Bloomberg Administration “myopic and shortsighted” at the City Council hearing that discussed the future of South Brooklyn’s waterfront. Nadler cited the growth of the region’s container shipping traffic, which has increased 60 percent since 2000. Go to story. "Twenty-two individuals, well-trained in the field of forensics, stand at their workstations. Meticulously they screen through buckets of debris, rooftop gravel and landfill brought in by a conveyor belt. They screen it and wet it down, searching by hand and eye, for anything that resembles human remains or bits of personal property. Once through the first layer, they lift the screen and sort through smaller pieces. Anything questionable goes into the small white bucket to their left. The screened debris is discarded and another bucketful is put before them. They repeat this routine for eight hours a day, five days a week, finding at least one remain almost every day..."
Sarah Ryley, writing for the Brooklyn Daily Eagle reports that evicted Coney Island entrepreneur Dianna Carlin said that most business tenants in the amusement district were “forced” to sign a confidentiality clause with developer Thor Equities that prohibited all public comments on the general topic of Coney Island development for the next four years. See the Eagle for the full story and photo of the owner of the hot-pink Lola Star. Searching Google Patents brings up thousands of inventions thought up by Brooklyn inventors over the years. 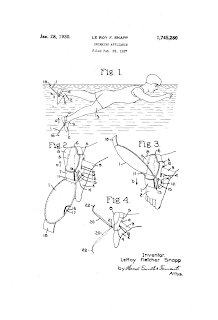 For example,in 1930, Leroy Fletcher Snapp invented a "swimming appliance" that attached to the bottom of each foot that gave a propelling effect similar to that provided by a fish's tail. In 1915, Newhall and Hescock came up with a method for protecting against torpedoes. It involved a lot of underwater nets. 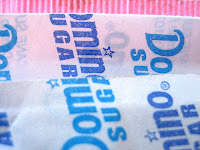 Oscar F. Boomer, in 1881, received a patent for a new means of rendering lard. In 2006, Brooklyn's creativity continued unabated. Marcia A. Dixon and Kenneth A. Tarlow received a patent for a multi purpose hand held cleaning device. Anthony Di Bitonto and Mark Muenchinger (from Brooklyn, along with a couple of pals from New York) received a patent for an improved tweezer. Again in 2006, Gennadiy Kitaygorodskiy and Aleksandr Temnorod received patent number 6994344 for "A Historical War Game with Flat Soldiers and a Method for Playing It."